it seems like it would be better if it was "one other Raptorian you control". I can see your point, but then you'd have to ask yourself why a Rogue would sneak attack an opponent only if they are in combat with another Raptorian. If they are a Rogue and fight without honor (hense the sneak attack), then it makes sense they would stab opponents in the back no matter who they were fighting with - Raptorian or Human alike. That and it's not likely the Rogues will be drafted outside of Raptorian builds, and further limiting their effectiveness to just Raptorian builds would keep them from being played in any other setting (which actually may or may not be an issue for some people). Either way, I think it keeps them effective if you decide to throw in other units with your Raptorians in a build. [center]Tetraites is back for another resubmission. I've taken to heart a lot of suggestions and feedback and developed - after much playtesting - what I believe to be the polished version... I would like to resubmit and nominate my custom Tetraites for your consideration, SoV. Looks like both these submissions have disappeared. Can we get these re-posted for review? Thanks for the reminder. The image has been restored. How different do these heroes look from the Beakface Sneaks? I know their weapons are different but do they otherwise blend into a crowd of them? There coloring makes the pop right out. you are far more likely to lose Crixus or Alistair amongst their squads. While I don't agree that the Beakfaces need help, having tested them extensively, they would welcome some variant options for their builds. I'm pleased with the restrained, simple designs, and the use of Common Heroes to fill out the Raptorian forces. to review the Beakface Archer and the Beakface Rogue. You cannot consider one Gladiator hero without considering his brethren, since their natural habitat is with the Capean Gladiators. In this regard we get the standard high attack and low defense of existing Classic and SoV at a similar point total. Tetraites is no Crixus (which Melee hero is?) but luckily they serve very different rolls in a Gladiator build, since Crixus is more about surviving with his shield while Tetraites gets his value from his Spiked Gauntlet. Retiarius and Priscus at 20 and 10 points less respectively also aren’t completely outclassed by Tetraites, as they again serve a different role in the Gladiator build. It is worth mentioning the Spartacus factor that can quickly break gladiator customs. 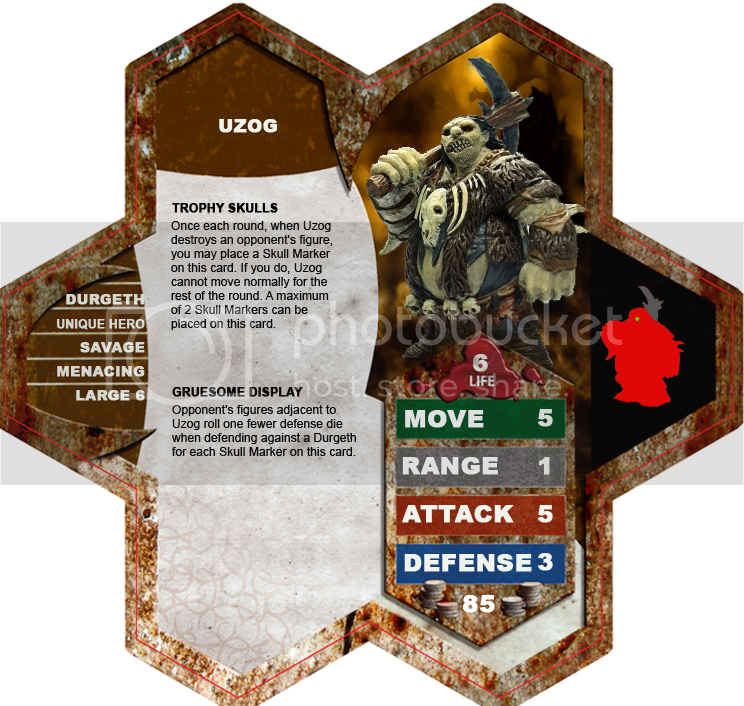 By having Tetraites’ gauntlet be dependent on a D20, it reduces Spartacus’ influence. At 5 attack dice, an extra die is almost over killing most match ups, and while the extra move and defence die are nice, you are paying 200 points for that, leaving little room for anything else in your army. Outside the world of the roman arena I found Manauvi to be agood analog. With identical stat boxes and D20 based multi-attacks they measure up so well it might be hard to call a winner in a one-on-one bout. Alistair is another good comparison able to attack twice a turn once a round, but requiring self-wounding. At 110 points Tetraites is costed below many 120 point heavy hitters, but priced above many of the single attack heroes at 100 points. Whetheras part of a Gladiator build or added as standalone hero in a battle royal, Tetraites price appears well balanced. Before Tetraites was submitted I was alreadyfeeling that there are enough Gladiator heroes in the Extended Canon, so any additions would have to be unique and novel. Giving Tetraites a way to attack multiple figures and potentially clear out the odd Deathreaver or other common screens opened up a niche he could fill. Playing with theme by making him Evil under Utgar’s banner first struck me as gimmicky but I came to appreciate the choice during game play (more on that in Theme below). Finishing blow is a wonderful flourish, like chocolate sauce on ice-cream – not necessary but still amazing. What I like most is that you wouldn’t know if the miniature or the design came first, they are that well matched. I struggled against early versions of Tetraites as an “evil” Gladiator. After testing Tetraites, I felt his theme comes across in actual game play. In this case rolling a D20 to auto wound a squad figure seems devious in its own right, as if it was cheap shot taken before the opponent was ready. Finishing Blow implies that he hitting a figure when it is already down, as if he is dispatching the enemy with a bit of disgust. At first I thought the mini looked a little to neutral, but his posture could also be one of “Come getsome” implying pride and conceit. Gladiators were known to use unique weapons allowing for the spiked gauntlet, and some were designated as “dispatchers” who would use a large hammer to end fallen gladiators. This all comes together to paint a clear picture of a merciless combatant. As a gladiator hero I tested Tetraites withand without Spartacus/Priscus in Capean armies as well as a standalone hero. I really liked Tetraites with Spartacus at 520, and would personally choose him over Marcu and Crixus at that point total. I found the extra Defense and move dice benefited him well, and destroying a Squad figure about a third of thetime was valuable when running the 3 man Gladiators against other 4 man bonding squads. It is worth remembering Spiked Gauntlet has similar likelihood to rolling 2 attack vs 3 defense and 3 attack vs 4 defense, so it is hardly a surething. 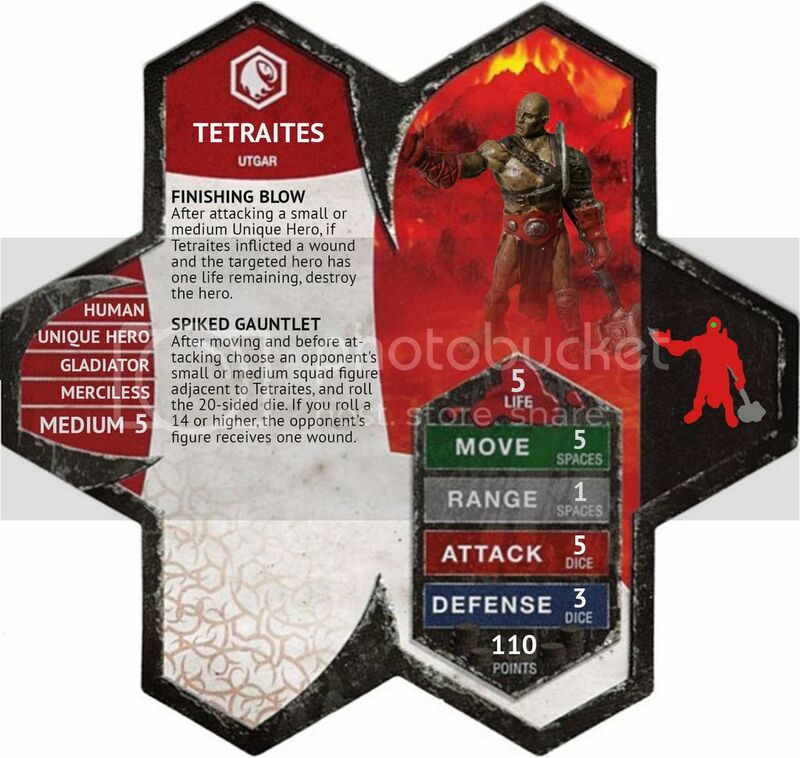 Tetraites main attack however at 5 (6 with Spartacus) is potentially devastating to all but the stoutest heroes. When playing without Spartacus I preferred to flank withTetraites if possible and let him work his way through stray squad figures since his weak defense made him easy prey for swarms of commons. When the battlefield is less clustered Tetraites is able to hold his own with other heavy hitting heroes, having put more than a few wounds on Joten and besting Alistair in battle. As a standalone hero he fairs as well as any other melee attacker, but has the added benefit of taking out that squad figure 1/3 of the time, allowing him to earn his points back all the faster. Of course Tetraites’ powers are easy enough to neutralize by either running Large or Huge figures in your army, or an all hero army (wyrmlings and elementals). There were a few times I wished he could finish off large heroes with Finishing Blow, specifically one instance where he caught Q9 off guard. Smart play can also reduce his attack output, since a smart opponent can position their figures to force a choice between hitting a hero hard or taking a roll with spiked gauntlet. Despite the potential to route Tetraites powers, he is still a valuable addition to a gladiator build, not to mention a fun standalone hero every now and again. The primary danger with introducing any bonding hero is a potential to either outclass, or be outclassed by existing units. Tetraites’role in a gladiator army and his point total are distinct enough to allow him to fit in builds and take on challenges ill-suited to the existing options. Even as a standalone hero Tetraites can be an interesting pick adding a little extra excitement when brining his hammer to bear against another medium hero. Last edited by wriggz; April 11th, 2018 at 10:21 AM. I abstain from the the Beakface Archer and Rouge, as I was involved in the design process. Wouldn't have thought Raptorians would wear make-up. I noticed that the curse of the Photobucket has also affected this submission. Last edited by Leaf_It; September 21st, 2017 at 11:34 PM. Reason: I'm oblivious at times. I'm not sure how I feel about the Sneaks over all to what value they add but it's not enough for me to turn them down outright. I vote YEA for review. Hey, I'd love to vote, but the curse of Photobucket has bitten. sorry for my absence here.